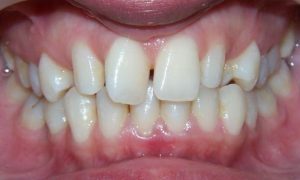 Veneers are ultra-thin, tooth-coloured covers designed to fit over the front surface of teeth to disguise imperfections. They are custom-made to conceal all manner of issues including misshapen teeth, small gaps, staining and chips. Veneers are also minimally invasive as only a tiny fraction of tooth enamel needs removing before they are fixed in place. If necessary, we remove a small amount of enamel from the tooth’s surface so the veneer will fit on to the natural tooth perfectly. 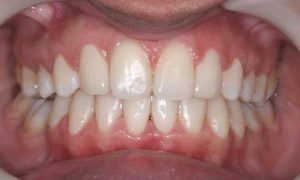 We take impressions which are then used to fabricate a perfectly fitting veneer, which is also colour-matched to blend with your natural teeth. When the veneer is ready, we clean and prepare the surface of the tooth and fix the veneer securely to the tooth with a strong dental adhesive. Try to treat your veneer with a little care. 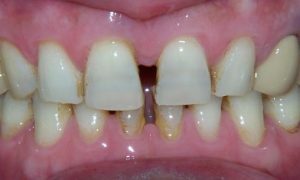 It is a tough restoration but could be damaged if you bite down heavily on very hard foods, bite your nails, chew items such as pen tops or open packets with your teeth. 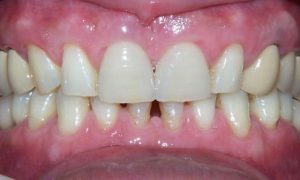 This patient decided on porcelain veneers to close the gap between his upper central incisors. We treated this patient with a combination of braces and veneers to improve the alignment and shape of her teeth.